to amble to our corner, stand and watch. of our green grass, or blandishments, or clucks. thereon, as country folk in August always do. The honour of our Gardens, and the miracle of flowers at this day, is the Heliotropion or Flower of the Sun; be it for the height of its stem, approaching to the heavens some cubits high: or beautie of the flower, being as big as a man's head, with a faire ruff on the neck; or, for the number of the leaves, or yellow, vying with the marigold, or, which is more, for al the qualities, nature, and properties of the Flower, which is to wheel about with the Sun; there being no Needle, that more punctually regards the Poles, then doth this Flower the glorious Sun. In the spring, Beloved set aside the packets of sunflower seeds that had accumulated, and announced that she would build Sunflower Houses. "What are those?" asked Risa. "They are sunflowers planted in a circle, so that children can play in the middle of them in high summer, and make believe that they are houses. It's an old tradition." Risa went to her books to look this up. 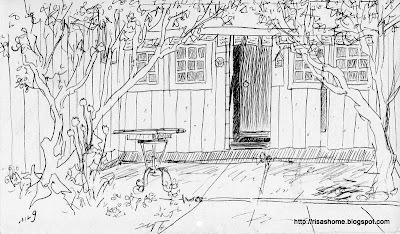 She didn't find any sunflower houses, but a favorite writer, the gentle Sharon Lovejoy, tells of Hollyhock Houses, which seems to be the same idea. She plants hollyhocks in a circle, and then when they are tall, ties them together to form the rafters of a kind of tipi. Beloved took her packets to the greenhouse, filled three flats of two-inch pots with potting soil, and poked one seed down a bit over a quarter of an inch into each one, humming a song about Mistress Mary. The long rains went on, and Risa's measured circle of elephant garlic came up, like a green and pungent Fairy Ring. She explained how this would work. "This is a circular garden; the rainbird in the middle will reach exactly to the garlic, all the way round, and this gap here is the entrance. Plant your tall things near the perimeter, and your short things, like squash vines near the middle, so that nothing is in any thing else's rain shadow." "Okay. And where do the sunflower houses go?" Risa furrowed her brows. "Won't some of them keep the water off the rest? I was kind of envisioning a row, sort of all the way or half way round, then corn further in, then tomatoes, like a sort of staircase." "Umm, okay, how about evenly spaced, though, around the perimeter?" "Sure, I'll put one here, and here, and here, and here..."
It was to be the Year of the Sunflower. For in the morning it beholdes his rising; in his journey, attends upon him; and eyeth him stil, wheresoever he goes; nor ever leaves following him, til he sink downe over head and eares in Tethis's bed, when not being able to behold him anie longer she droops and languishes, til he arise: and then followes him againe to his old lodging, as constantly as ever; with him it riseth, with him it falles, and with him riseth againe. The sunflowers did not appear only in the circle garden. Another sunflower house came up in the hilltop garden, menacing the lettuce and onion beds. And there were genetically engineered sunnies in all the beds around the house; tiny ones, and full sized ones that stood on short thick stems, as if someone had beheaded some giant and left the trophy by the city walls. Many of these were along the east side of the house, and followed the sun until midday, then continued staring straight up, as though wondering what had become of their lord and master. Eventually they became too heavy with seed for this myopia, and drooped daylong, no longer befriended of bees but increasingly frequented by birds. At first we admired their sunny looks among the poppies, zinnias, marigolds and such, but, later, in seed time, their ungainliness seemed to us to class with the bachelor buttons, the feathery cosmos, and the larkspurs, and we pretended not to see them. Nature hath done wel in not affording it anie odour at al; for with so much beautie and admirable singularities, had there been odour infused therinto, and the sweetnesse of odoriferous flowers withal, even men, who are now half mad in adoring the same for its excellent guifts, would then have been stark mad indeed, with doting upon it. Sunflowers are difficult to ignore. On a hot day in August, Risa went to the circular garden to look (vain hope) for a reddening blush on the hundreds of green tomatoes, and as she sloped along, parting branches, ran headlong into a massive flower head, dangling on a stem bent double with the weight, and a good eighteen inches across. Such a plant demands attention, and will bludgeon you if it doesn't get it. She growled and pushed it away, and it came swinging insistently back across her path. Involuntarily her eye followed the stem into the thicket from whence it had sprung. Oh, yes! Sunflower houses. Well, there's such a thing here, she supposed, except it's awfully weedy in there; no child has had a go this year. She went looking for Daughter. But Nature, it seems, when first she framed a pattern for the rest, not being throughly resolved, what to make it, tree or flower, having brought her workmanship almost unto the top, after a litle pause perhaps, at al adventure put a flower upon it, and so for haste, forgot to put the Musks into it. Wherupon, to countervaile her neglect heerin, the benigne Sol, of meer regard and true compassion, graced her by his frequent and assiduous lookes with those golden rayes it hath. And as the Sun shewes himself to be enamoured with her, she, as reason would, is no lesse taken with his beautie, and by her wil (if by looks we may guesse of the wil) would faine be with him. But like an Estritch, with its leaves as wings, it makes unprofitable offers, to mount up unto him, and to dwel with him; but being tyed by the root, it doth but offer, and no more. Daughter at first was dubious. She had after all, recently seen Little Shop of Horrors. But mothers are still to be humored, until one reaches a certain age. Risa rummaged about in the garage and came up with a couple of large scraps of carpet. By throwing one onto the grassy floor of the Sunflower House, she was able to make it instantly homey -- and Daughter took over from there. "I'll be right back," she said, and before Risa knew it, my weeding was over for the day. Daughter returned with a wagonload of dolls. "You move into that one over there...and you'll be new in the neighborhood...and we'll come over and see you -- oops, not enough room -- so you come and see us, and we'll invite you in to tea." In this fashion are afternoons of Important Grownup Work lost forever. It is surprisingly cool in the Sunflower House, while the sun's rays are broiling the homeyard only inches away, and shimmering the landscape near and far. One can play for a long time in such a space, and forget the approach of evening. When they gathered their tea things to retreat to their night home, they found the shadows long and the air golden, and a massive flock of Canada geese skimmed over low, low enough for Daughter to hear the wind their wings made, heading for the river and the gleaning of the wheat fields there. Beloved met them at the door, and she, being the artist that she is, knew not to break the wondering silence. She only smiled to see that the web of Sunflower Houses she had woven months before had made its catch. It's thus an old tradition becomes a new one. It is like the Scepter which the Paynims attribute to their Deitie, that beares an Eye on the top; while this flower is nothing els but an Eye, set on the point of its stem; not to regard the affayres of Mortals so much, as to eye the immortal Sunne with its whole propension; the middle of which flower, where the seed is, as the white of the eye, is like a Turkie-carpet, or some finer cloth wrought with curious needle-work, which is al she hath to entertaine her Paramour. Friends came, from far away, to visit. Adults sat round in the shade of the east front, stirring cups. The screen door banged. Daughter and Daughter's friend and the dolls headed for the garden. We will remember the Meteor Night in winter, when the leaden clouds, heavy with Pacific rain, shut out Orion and his gleaming belt. We will remember the tomatoes, Better Boy, Cherry, Brandywine, and Golden Jubilee, when their poor cousin, the frozen tomato soup, is brought from the freezer to thaw. But most of all, as the huge seed heads are plunked, face up, in the pasture to gladden the hearts of the poultry (and the shivering juncos and chickadees), we will remember the Sunflower Houses. A July dinner for one. For the following Risa stripped the better leaves from whole pulled bolted spinach, which she gave to the chickens, ducks and geese. Then she watched them eat, while they watched her eat. This seemed a satisfactory arrangement. Cut up Peas, stem of Joi Choi, Beet and stems of Beet leaves. Steam ten minutes. We use a little Sunbeam rice cooker/vegetable steamer. Chop greens, with Onion flowers, and add to steamer at five or four minutes to go. Drain, serve with sliced hard boiled Duck Egg. steeped while in full sun five hours, then chilled. You might prefer the traditional ginger, but Risa's not that big on ginger. Well, she might put in a little. You may use the water from the steamer and the colander in baking, soups, switchels, or give back to the garden. ...the women and children brought out food and drink to them. Country people know that haymakers appreciate and even need flavored drinks while out harvesting. A sweating worker might tire of plain water, so many people made "switchel," the summertime drink that could restore a haymaker's energy on even the most sweltering days. -- The Haymakers: a Chronicle of Five Farm Families, Steven R. Hoffbeck. Risa runs a little bit of well water from the tap every morning, and toasts the garden with it. This year's garden is making a poor showing compared to most at Stony Run, due to the cold, late start; but every garden deserves to be thanked, don't you think? When we survey the acre of land with which we have surrounded ourselves, the oak and ash trees, rhododendron, sunchoke patch, barn, and house, we turn upon all these things a critic's eye, and keep ready to hand the pruning knife, fence hammer, and trim brush. They do not yet appear as we see them in our mental eye, and we shape them toward an end which we acknowledge as ours, though we sometimes remember they serve other ends as well. Risa shapes the trees to her own pleasure. But so do children, for whom trees are for climbing. So do birds, whose need is nesting; so also carpenter ants, who must bring nectar to that vast colony somewhere in our eaves. We knew, long ago, that we would come to such a place, with its diverse longings, so we called for a document to mark the beginning of our life together. Such a thing could be bought, but we both said, " oh, no, it must be hand made." We could see it as clearly as if it were already done. Each could describe it to the other, and to the other it was the describing of a thing already seen. The young student who volunteered, who shaped our wedding scroll, our fractur, with its brave words, was commissioned also to frame it with a house and trees, flowers, birds, a sense of place in a clearing amid woods. I think she understood this commission, this designing of a dream, that it was our weaving of a spell to catch our future, to make a future. And all who signed that Quaker wedding certificate, thirty-nine in number, understood: hope made visible. This is what art is, though we are living a time when it is not fashionable (at least among the intelligentsia) to say so. We get, occasionally, a visitor who signed that document twenty years ago. There is a pause as we come, in the "tour," to the wedding certificate in its place above the mantel, and there is an almost invariable recognition. The trees, the house in a clearing, an unimpeded view of a mountain, a circling raptor. They smile. "You were headed for this place the whole time, weren't you?" Such a dream is a lot to put one's name to, so we owe our thirty-nine witnesses much. Risa didn't know then, and maybe she does not know now, what the painting meant to those gathered round to hear our vows and sign their names. But it's enough to know they liked it, and still do, and so easily make the connection from it to our present life. Their approval leads her to believe, a little, in her own and Beloved's wisdom: that we could see a way forward, and say so; then having said, follow through. This is prophecy, the oldest art, which also called simply the art of living. Every gardener is an artist in this most ancient sense. The seeds and starts, balled trees, piles of rocks, and bags of soil amendment are pieces of a vision already seen, to be brought together with a willing toil and persistence. Even when the planting and placing of the elements of this vision is done, the vision is not yet attained: what was once seen is still a future glory, which the reality must yet grow into. Risa's beans just now are two to three feet high, yet her vision of them towers over her; in her mind's eye they are seven to eight feet, reaching blooms toward the winging of the hummingbirds. These bean vines-to-be, hovering in the air above the current scene, are in a sense the real garden, the garden of the mind toward which the outward garden is progressing. The two gardens will not come together without labor. Tragedy ever waits in a garden's wings. Risa intervenes by fighting slugs and removing grass and dandelions, and by watering. Watering is a different ritual with every gardener-artist. Some set up their summer sprinklers right away and leave it all to a timer and the available water pressure; those who can afford the initial outlay very wisely invest in a drip system, with the tiny tubes running along every bed, stopping to weep only at a hill of zucchini or at the feet of each of the rhodies. We're a low-budget outfit, so our tools, especially early in the garden year, tend to be labor-intensive. At each end of the house is a spigot, low to the ground to prevent freezing in winter, and to these we have attached enough lengths of cheap garden hose to reach the ducks and geese, the upper garden, the lower garden, the orchard garden, and the various fruit trees and flower beds. Beloved does the animals, and the Front Beds, which are mostly poppies and marigolds this year -- wherever she can tear out enough mint and oregano. This involves a constant war over nozzles. Beoved really only likes one, a greenish fan-shaped thing that hits exactly the right width at four feet to sweep a garden row in one slow pass. She bought it over twenty-five years, ago and it has spent enough of that time sunning itself on its coils of hose to have faded in color, and it even seems to have lost weight, as though the years of water rushing through have eroded the plastic from within till we handle it like a blown egg. Risa dreads the day that she may step on it. Risa tries this nozzle every year for five minutes, but then she gets restive. It hasn't enough reach, and she's one of those who stands in one spot dispensing favors near and far. So she generally winds up removing the sweep and hanging it in the crook of the nearest apple, and puts in its place an old fashioned brass nozzle. Antique ones are well made; get one of these. With the brass nozzle you can produce a fine mist eight feet across, or a brave fireman's blast that fans out, forty feet away, just enough to water a distant tree without accidentally digging it up. There's really no better tool for demonstrating the phrase "all-purpose." These are easily misplaced, however; not for the weak-eyed. Our current compromise is the "pistol-grip." You can get a quite good visible one, bright yellow, American-made, too, for only three dollars. Be absolutely sure to get the one that is garden-hose threaded for attachments. The thing is highly functional as is, but once you learn what the threading is there for you'll be pleased. There is one other gadget in this category that we own, and that is a water wand, the kind that is about three feet long with a valve at one end and a nice aluminum rose at the other, on a slender crooked neck. We like the wand very much, at least when working with young plants, because of the so-tiny droplets it produces without choking back the volume of water the way the brass nozzles do. The secret to the wand is to hold it "upside down"; the rose should tip up like a flower (a rose), facing the sun, and its drops should rise into the air and fall by force of gravity alone, gently washing the mulch at the feet of your seedlings. The idea is to imitate, not rain, but a long-necked watering can of the English type, with its brass rose. Risa drapes the hose over her shoulder and wanders along, visiting plants and offering them the wash of life at their feet, where it's wanted. It's very meditative, using the wand, because there is no back pressure in the hose. There are times when you want the rain effect of the sweep or the mist of the wand, without losing the flow control offered by the pistol grip mechanism. Because you've bought the one with the threaded barrel, you can simply attach the other nozzles as needed, creating the right tool for the job at hand. 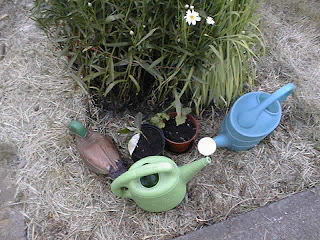 When we walk about, watering with these various implements, it is generally evening. Direct sun will evaporate much of any water offered at mid-day, and in the mornings Beloved is off to work. Evenings are good for water economy and good for us. We fall into the routine, still noticing weeds that will need attention, or transplants that have stayed overlong in shock, but mostly We're able to relax and look around. Beloved tucks a bit more straw around her newly transplanted lettuce. A swallow sits on the clothesline in his green dinner jacket and scolds Risa for getting too close to the birdhouse on the potting-shed wall. The moon rises, sullen and red-faced at first, then brightens as night comes on, and the last of the sun sweeps up the face of Jasper Mountain and disappears where there will soon be stars. It is altogether restful to water a garden by hand if you have the time. Take your garden's advice: forget the evening news and the sitcoms. We gather up containers for the freezer, and a Sharpie for writing on the container, spread out some newspaper, find a round toothpick, an old-fashioned milk bottle or a glass carafe, the basketball pump, the high-speed Dremel-style tool (ours is a Craftsman), and a bowl of soapy, salty water. With the little cone-shaped grindstone, we zip off a bit of shell at each end, about as big as the head on a six-penny box nail, and punch through the membrane with the toothpick, stirring up the yolk, then place the egg on top of a suitably wide-mouthed bottle and gently pressurize the contents with the basketball needle. You can just barely see a small rubber gasket here, cut from a flat rubber band, to seal the contact between egg and needle. Every second egg we pour off the eggs into a freezer container, so that if we get into a bad egg (never has happened) we won't waste a lot. Mark the container "Goose '09 '10." Wash the eggshell inside and out (draw some soapy salt water into the shell and shake vigorously, then blow out). Repeat. Freeze containers, sun-dry shells. 49 eggs came through. Three were too thin-shelled and cracked under the air pressure. Or maybe Risa was too pump-happy. Last year there were 27. In a few days they are ready to decorate or sell to Pisanki painters ... whatever suits ya. I like to just sit by the table and look at them. It's going to be 98F. What to do? 1. Coffee and a small bowl of hand-ground grains, cooked with honey, on the patio with Beloved, who's having yogurt and some of last year's blackberries. 2. Let out the poultry and check their water. Gather duck eggs. 3. See Beloved off to work. 4.. Start the soaker hoses. 5.. Pick some favas and peas to shell in the shade later when it's hotter. 6.. Gather outer leaves from cabbages, kale, bok choi, beets, chard, turnips, spinach, collards, cauliflower -- pretty much whatever people will turn up their nose at for having holes in it, or is about to bolt. Debug. 7. Spread leaves in dehydrator. In two days they will be ready to strip and crumble to make a fabulously nutritious and attractive additive to soups, stews, pastas, breads, and salads. Pretty much anything. Year round. 8. Gather hen eggs. Lunch of salad with hard-boiled eggs and new potatoes. 9. Shell beans and peas in the shade with a light green drink of mint with whatever, whizzed and strained and cooled. 10. Get around to the dishes in the cool of the house -- 68F while it's already 93F outside, thanks to shades on the outside of windows, insulation, white roof and walls -- and think about what to fix for dinner. Maybe salad tossed with grilled tofu and sunflower seeds, with homebrewed Hefeweizen? The shed, now torn down and transported, has been put to use immediately at Stony Run. Here a set of windows acquired from Bring Recycling ($80 for four, with real divided lights and storm panes) are framed into the front porch to make a mudroom. The doorposts and the 1X12s are painted white. On the interior, fiberglass goes into the new studwalls and the interior walls are finished with Masonite from the shed and painted white, with a green "wainscot" or splash zone, a foot high, for muddy boots and such. The rain gear and barn coats are already hanging on hooks, ready for next year. We weren't able to re-use the storm door for the new entryway, as it is metal and the entryway is only 77 inches high. So Risa is on the lookout for a wooden screen door that can be cut down to this height and also double as a storm door. But already the new room is helping cool the house in summer, and it looks forward to helping keep the house warm in winter, as well as being the place to split kindling and change boots. Do you have any recycling construction projects going or planned? Another neighbor's place ... they used to grow turf grass seed but this year the near 80 has hay that's just been mowed and the far 80 has wheat. The power lines are from a smallish hydro system, one dam has two turbines and the other has one. Bald eagles like to sit on the towers. Here's another neighbor. We have two yearling does on one side of us: Blondie and Bridget. This is Bridget. On the other side there were two bucks, Buck and Owens. We haven't seen Buck and Owens lately; a new generation has manifested in the extended family that owns the place, and they brought horses. The geese talk to the new horses a lot and the horses listen very politely. 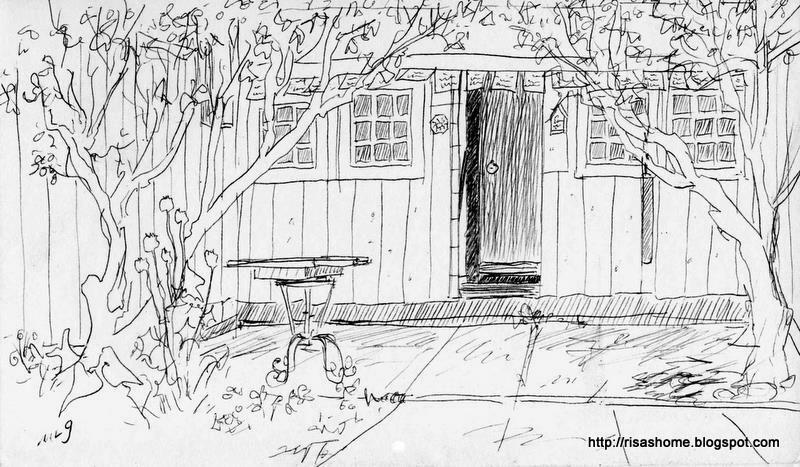 Risa has spent a third day collecting the small shed from her friends' place. She dropped the back wall and dismantled it; then pulled up the plywood flooring by putting both prybars under the edges and "walking" them along the sheet. She expected 2X4 joists framed on 2X4 plates on pier blocks, but found 4X8s doubling as joists and sill plates, resting freely on half-buried cinder blocks with tarpaper on them for vapor barrier. One of the 4X8s will need to be consigned to firewood, but the other three are in good condition. She'll use two of them to replace the rotten 4X4 posts supporting Stony Run's front porch, which she's planning to frame in as a mudroom next week. Here's the site of the former shed. It made four truck loads of good material; they don't build them like that anymore!